I guess you would need to print it out and then stick it on some card. I`ll keep an update on progress here but I`m not too sure how long it will sit again before I get around to it. What I did find interesting was, I wonder how easy it would be to replecate this in metal using the paper as templates or to take measurements? Well, I guess that cost that high cost will not be an excuse for building this one. Now that we are using scrap paper as our building material, where does it go from here? I also forgot to post this - someone has spent ages doing a stop time time animation of this clock build. It is amazing and also a nice idea for a stop time animation project log of a metal build! Since the Video in the above post has been disabled by request I have found the link and posted it here. In order to make it work, copy and paste the whole line (spaces included) into a new browser window. delete the 3 spaces in front of and behind youtube and press enter and it should work. Cheers Don as it is well worth a watch - interesting piece of film not only a nice project. I want to make my own gear cutters using a method devised by myself thats one reason I'm build the tool post grinder, it may be a big failure but that doesn't matter having a try is what counts. Computers may be smart sometimes but they only do what we tell them to do. They can be outsmarted sometimes as shown above. I don't know why youtube does that. They want you to watch their videos then they disable them so you can't watch them. Most people would just give up but I decided that when that happens to fight back as best as I can. 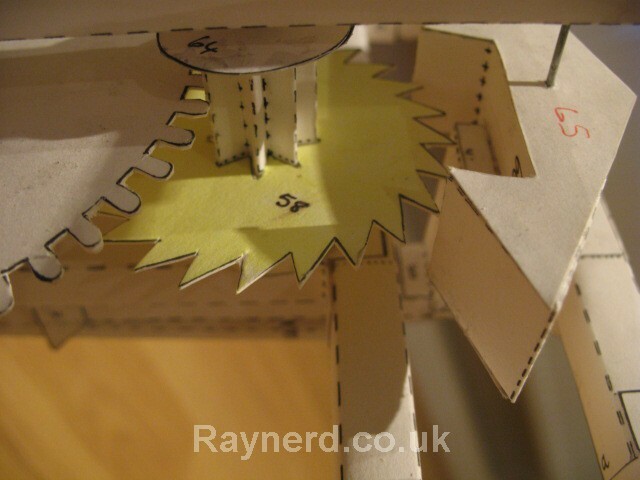 Stew, what is your opinion on copying and perhaps down scaling the escapement of this paper clock as a little trial run for me to try. Forgetting just now about the actual maching methods, I can only presume that if I was to copy the parts in metal it would still work? 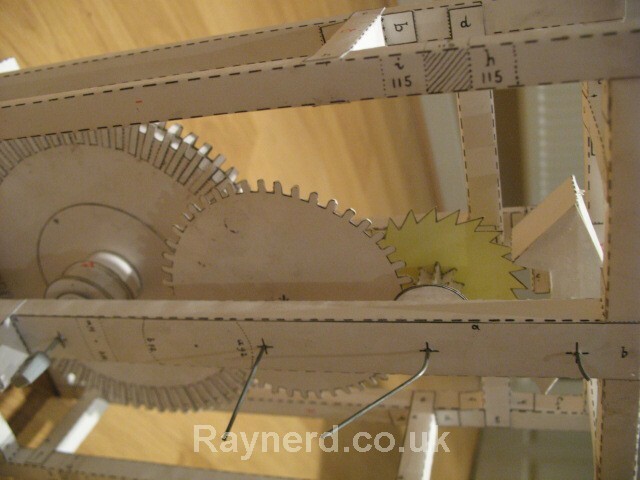 I`d need a simple frame, the escape wheel and could even connect a weight directly to my escape wheel. Hummmm .... food for thought!? That is really cool Chris, I'd love to make a clock someday ( another one on the list ) I reckon if you are to copy the paper design onto metal you may want to thin out the gears and lighten them as much as poss' to reduce the effects of friction and weight from slowing down the clock, I think that's why clockmakers use very thin gears ( or wheels as they call them ) and cut out as much as they can from them. I look forward to seeing what you are able to make. Tim's spot on when he says about reducing the weight thats why clockmakers make wheels (gears) with thin spokes. Thanks for the reply stew, yea I have that on my favourates. 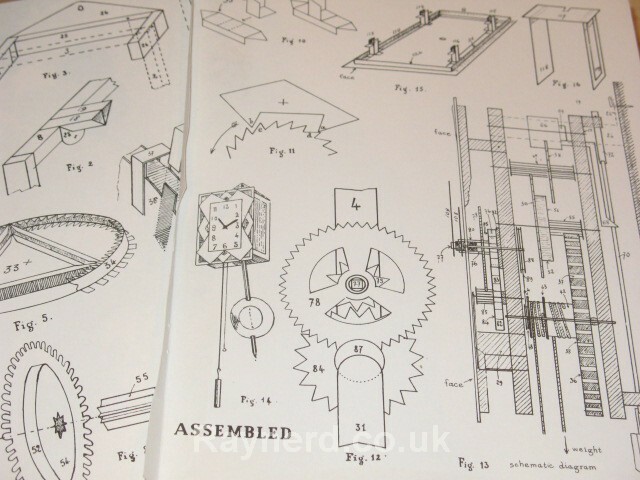 The NAWCC have a good forum for clock repair and building. 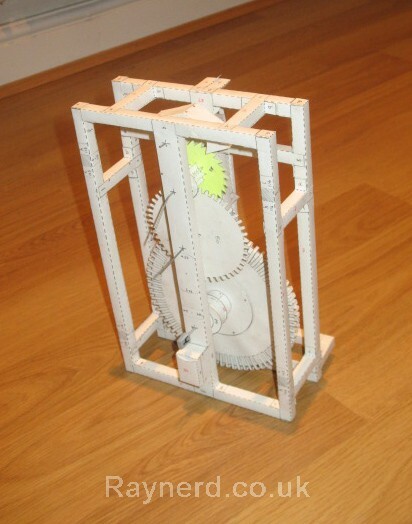 I have put in a lot of effort in my searching but I have never come across a step by step project build of a clock ... if anyone has one, I`d be greatful for a link. That looks like a great project, but I don't think I could bring myself to make it from paper! Not sure the feeling you would get when finished ... for me it'd be a case of right, the concepts been proven, now make it out of a proper material ... which would be much more difficult and probably take about 100 x as long to do! Great stuff though Chris, thanks for sharing. My father is a watchmaker from way back. He still repairs watches and clocks for people - most often old cuckoos. It's not unusual for him to have 4 or 5 in the downstairs room running, so he can get the timing right. Kind of funny, as he likes 60's modern, and considers them hideously ugly. Anyway, he is also a model builder (plastic kits), and recently aquired an old Lindberg kit of an old fashioned (13 century) clock. Molded to look like wood, it's all plastic except for the chains that hold the weights. Surprisingly, it keeps perfect time. Looks a lot like the paper one, but a bit more ornate. Another story, this one involving *gasp! * wood. My dad has aquired a good reputation in his clock repair, and word has spread. Seems a friend of a friend of a friend had this really ancient cuckoo clock, made in Germany or Austria or somewhere like that. Made in the late 1400's to early 1500's, it had passed from generation to generation, and was considered the family treasure. Very ornate, to the point of being obnoxious. Worth a small fortune, except for one detail: it no longer ran. Still, being so old and nearly flawless in appearance, it was worth many thousands, and completely irreplaceable. So, with some trepidation, he approached my father to inquire about fixing it. Opening it up revealed one of the main gears had lost a tooth, sheared clean off. 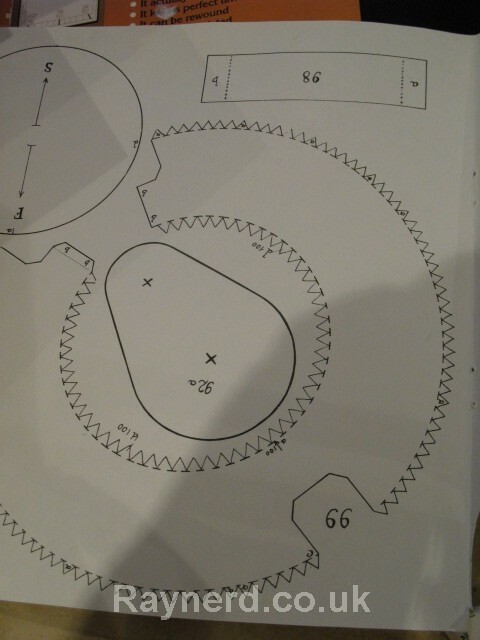 Now, you have to realize that making a new gear, or a sloppy (i.e. obvious) repair of the gear would lower it's value greatly. Original but not functioning is worth much more than fixed! So, with that in mind, dad set to work. First he had to match the type and grain of the original wood. Several samples were obtained, and utilizing several hand-mixed stains, test pieces were made. I think the final choice was black walnut. 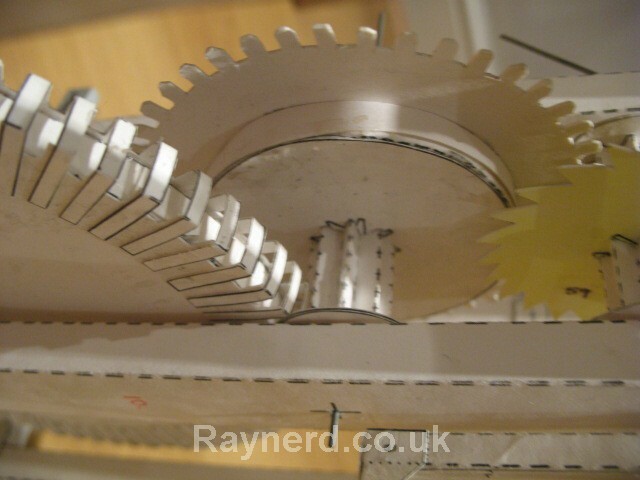 Next, the broken gear had to be cut to allow the new tooth to be inserted. The tooth was carefully shaped by hand until it was a perfect profile. After that, glue was mixed with stain and the tooth glued in place. Careful sanding, staining and varnishing was done to match the original finish, blackened with age. The clock was timed, and worked perfectly. Even knowing where the repair was done, afterwards it was almost impossible to find. The now functional clock was returned, along with the bill. I think it was for something like $150, and my dad felt a bit guilty charging that much. Imagine his surprise when, several days later the man showed up in person to hand my father a stack of $100 bills. Seems he had gone and had the clock reappraised. The value had almost trippled, and he showed his appreciation for the fine work by paying the bill 10 times over. That was a dozen years ago, and he still brags about it. 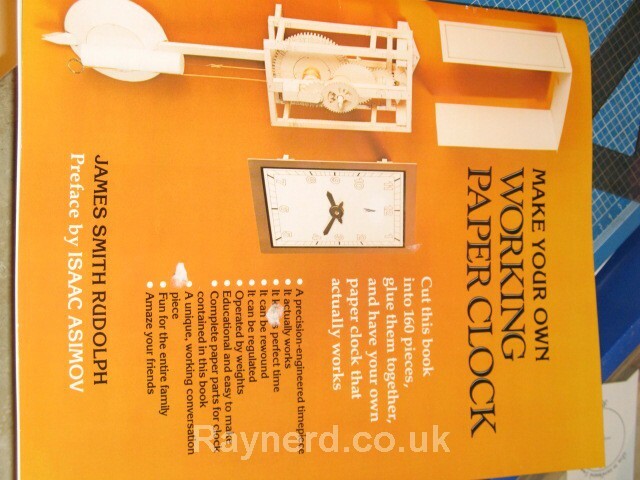 This has really sparked my enthusiasm for clock building - it is the reason I got my first lathe, a Unimat 3, many years ago much before I was interested in pens. I am considering trying to cut a wheel this weekend.... I still have work to do to finish my shop rebuild so we`ll see. Every once in a while a story like this comes along. It is nice to see that sometimes people remember who did what and will go back and share their reward. It is also another reason why it pays to do the best job that you can. You never know who is going to see your work or when. Please pass on to your Dad congratulations on a fine repair. My wife and I ran a store where we sold and repaired clocks untill a couple of years a go and my wife's health started going south and then mine started to fail we ran it for about ten years. I really enjoyed doing it it kind of gits in your blood but with health issues and not making enough money to make ends meet we had to close it and I went on disability and my wife's health issues caught up with her about a year and a half ago when she passed away. I got interested in clocks back in the late 60's and I still enjoy messing with them. Cliff.